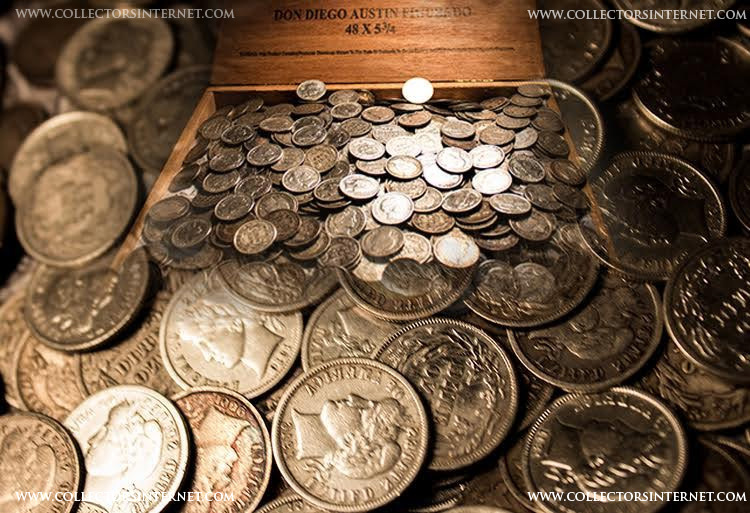 From an old family estate in El Paso, we’ve been sold an old cigar box full of Barber Dimes. According to their family history, their Great, Great Grandfather was born in the 1880s, and as his income rose in the 1920s, he began to put aside all of the “high quality Barber dimes he could find”. At first, he would put them carefully in old envelopes, but as those filled up, he transferred them to a succession of old cigar boxes, including the one in the photo. He made sure that all of the coins had a “Full Liberty” so all the coins easily grade full Fine, VF, XF, AU and even a few that some other coin dealers would call Choice Uncirculated. Since El Paso was one of the major railroad routes from the West to the East and vice-versa from the 1880s to the 1920s, there is a nice selection of mint marks, with plenty of P, O, D and S mints. In fact, this hoard is of such quality, that we guarantee at least one S mint from the 1800s in every group of 10 or 50 ordered ordered! We’ve been in the coin business for over 50 years, with more than 300 years of combined experience among our staff, and none of us have ever come across a hoard of high-grade Barber Dimes at even half of this quantity and quality, and we doubt if we ever will. 10 Different Dates/Mints in AU to Uncirculated, some with beautiful rainbow toning if you prefer (Please state preference of brilliant or rainbow toning). Only $250. Roll of 50 for only $950. We also have some old, vintage, solid-wood cigar boxes with solid brass hinges that look like small treasure chests, about the half the size of a breadbox. A few local antique shops are asking $50 to $100 for theirs, we got three with the hoard and are selling them at $35 each or $95 for all three.